Unfortunately, safety is all too often seen as an “add-on” that organizations address at the end of a process—almost a box you check and then move on. At Prescott, safety is more than an afterthought. We begin the process of planning each job with safety at the forefront. Here safety defines when we go and how we will get it done. Our state-of-the-art safety assessment and risk management tools and processes are built into every step of how we train our planners, dispatchers, aircrew, and mechanics—and how we perform our jobs. 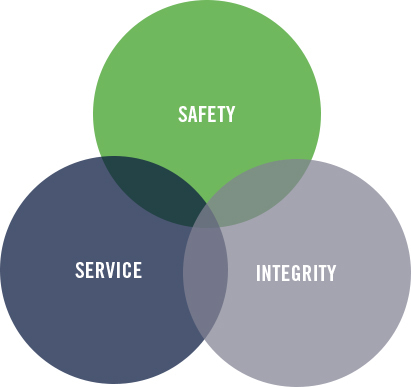 Our customers value our proactive approach and company-wide commitment to safety. We don’t assume that mistakes will never happen: we plan for them. At Prescott, we constantly enhance our processes, technologies, and tools to identify and reduce human error before mistakes happen. And we have designed and implemented our quality control and assurance processes to constantly assess and evaluate the safety of our operations and point to ways to operate more safely. When the inevitable hazards emerge, our strongest line of defense is and always will be our people. This is where our culture and values matter: anyone at Prescott can scrub the mission. We count on every member of our team to remain vigilant and to speak up if they see anything that concerns them. Then we can stop and figure it out before it’s too late. Proven people, processes, and technology - why we have never had an accident in our corporate history. Operating accident-free for 11 years is no accident. We are constantly developing and reengineering our processes, tools, and technologies to make sure we are always meeting the highest safety standards. This is how we achieve a safety baseline that is unquestionably above the regulatory requirements. or could put our people or equipment at risk, please contact us right away.